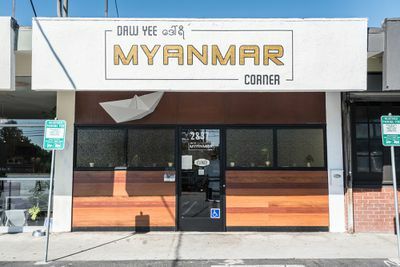 Ask Delyn Chow, the chef-owner of the new Daw Yee Myanmar Corner in Silver Lake, to describe Burmese food, and instead he’ll list off a slew of influences: Thai herbs, Indian spices, Chinese noodles. Fair enough. Keep asking and instead Chow will point you towards a goopy spoonful of mohinga, the thick catfish stew served with thin rice noodles. It’s the national dish of Myanmar, formerly known as Burma, and works as a fair barometer for the cuisine in total. One can simply look at a map to see that Myanmar’s geography translates to its culinary makeup. Burmese recipes, just like Chinese and Thai, are inexact and passed down through generations by word of mouth or through family tradition. 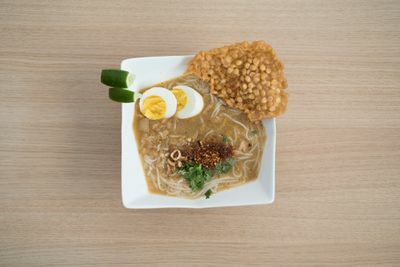 Take the mohinga, with its catfish, ginger, lemongrass, turmeric, and rice powder. It’s a fickle soup that’s not only unique to each Burmese family, but somehow different every time it’s made. Chow has assigned two people to oversee this particular dish at Daw Yee, which means it’ll likely taste one way for lunch, and another way for dinner. For many years now, Angelenos have been able to find the highest concentration of America’s best Thai food in and around Hollywood, and the best Chinese food to the east in San Gabriel Valley. The main reason, of course, is always the people. More Thai people live in Los Angeles than anywhere outside Thailand, while Monterey Park has the highest concentration of Chinese Americans of any municipality in the United States, numbering some 44% of the total population in that city alone. That doesn’t touch upon neighboring Alhambra or the eastern side of the San Gabriel Valley, in cities like West Covina, Rowland Heights, and Diamond Bar — the new frontier in Chinese and Taiwanese food in America. By contrast, the 2010 U.S. Census counted only 6,100 Burmese living in the Los Angeles-Long Beach-Santa Ana area, with the largest concentration existing in the San Gabriel Valley. The Bay Area received its first Burmese restaurant in the early 1980s, with an explosion in popularity in the early the 2000s thanks to places like Burma Superstar. Now there are over two dozen Burmese restaurants in San Francisco, compared to L.A.’s small handful. 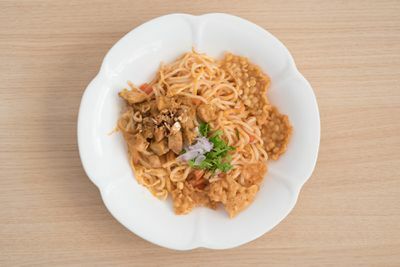 It’s evident that Burmese cuisine has become entrenched in the Bay Area’s culinary culture, while it’s just making its mark in the Southland. That’s where Daw Yee comes in. Like many Burmese in the United States, Chow is ethnically Chinese. His family fled from Guangdong, China to Yangon, Burma in the 1930s, staying there before moving to Taipei for four years during the young Chow’s elementary school years in the late 1980’s. Ultimately, the family moved on to Southern California in 1993, making for a fairly recent American emigration. Daw Yee Myanmar, named after the matriarch of the family, opened exactly twenty years later. Delyn Chow saved money for years in order to secure the new location in Silver Lake, which officially opened on June 8 of this year. He wanted to expand simply because it’s now his neighborhood. He and his friends live near the restaurant, but Chow wasn’t interested in outshining his family’s original location in Monterey Park. So instead, he honored the family’s legacy by making his restaurant a subsidiary of the original location to the east, officially naming it Daw Yee Myanmar Corner. His mother still makes all the desserts. Though there’s essentially no distinction in the recipes from Monterey Park to Silver Lake, Chow maintains that the clientele is different. 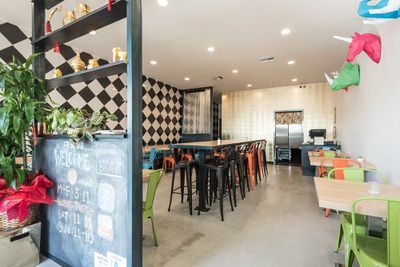 There’s always an air of authenticity, but when a popular original dish called pork mix, a finely chopped selection of offal served over rice, made it to the new space in Silver Lake, it fizzled out within a few days. Chow says he’s still curious to see how the neighborhood will receive an upcoming goat curry special, but in general is optimistic about the community’s curious palates. As expected, you’ll also find more vegetarian and gluten-free diners in Silver Lake than in Monterey Park. That actually plays to Daw Yee’s strengths, since Burmese food uniquely uses rice flour as a thickening agent, versus wheat flour or gelatin. Chow also doesn’t believe in using fake meats, which tend to contain a lot of chemicals to achieve their flavor, so don’t expect seitan versions of your favorite menu item. Still, labeling things as “gluten-free” and “vegetarian” are alarming to those who err on the side of so-called authenticity (despite that term’s variable meanings), as there’s an assumption that a dish has been compromised simply because it doesn’t contain gluten or meat. Although the recipes are unchanged thanks to the nature of Burmese food, Chow does recognize that speaking the language of the neighborhood is as just as important as recognizing what the community wants to eat. 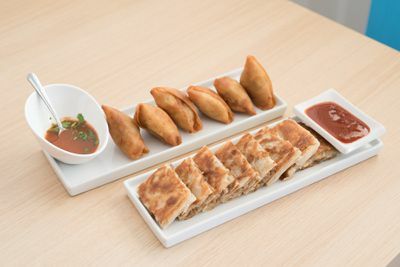 At the same time, Silver Lake diners are learning about Burmese flavors through the cuisine’s essential dishes, like lahpet thoke, the iconic fermented tea leaf salad or kima platha, which are essentially meat-stuffed pancakes. On the table you’ll find fish sauce alongside a jar of dried shrimp relish, or balachaung, as well as chili sauce, all packed onto a condiment tray should diners seek more heat, funk, and umami. The traditional drinks on offer, such as malasong and faluda, are sweet milky cooling agents made with coconut milk, pandan jelly, and tapioca. It’s an exciting time to eat in Silver Lake, and especially Los Angeles at large right now. It’s too easy and yet too lazy dismiss things as “hipster” by virtue of a previously unfamiliar cuisine reaching a too-hot neighborhood. Daw Yee Myanmar Corner could represent a positive aspect of gentrification. In one restaurant, they’ve brought a diet accommodating everyone from Buddhists to the vegans and vegetarians of Silver Lake — all the while introducing the food of a new culture to the neighborhood. And while locals have always known Pho Cafe, known as “Hipster Pho,” now there’s Thai food at Same Same wine bar next door, modern renditions of Taiwanese down the street at Pine & Crane, the populist Silverlake Ramen, and of course — not least — the celebrated Thai cooking at Night + Market Song. In a sense, Daw Yee joins the wide breadth of Asian cuisines represented in Silver Lake, one of LA’s hottest neighborhoods. And if there are any qualms that it’s not “authentic” or potent enough, just add more fish sauce.